You can enjoy the holiday of your life in the heart of the Périgord Noir. 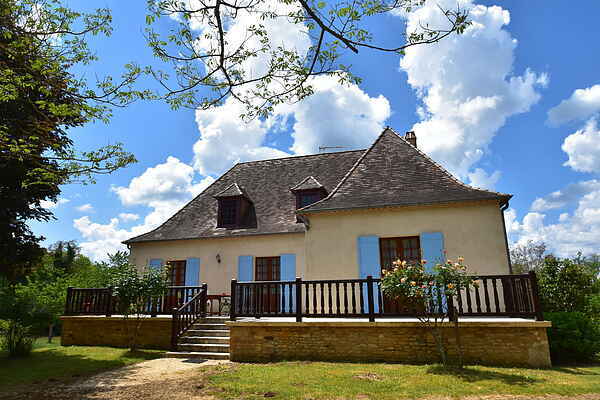 This detached holiday home near Villefranche-du-Périgord (4 km) has a large garden with chestnut trees and fruit bearing trees (apple, cherry and peach). It is just like paradise. There is a sandbox for the children, a swing and ample space for a soccer or jeu-de-boules match. From the terrace (via a few steps) you can enjoy the magnificent view. A fawn might just walk by in the evening. The area is brimming with sights worth seeing. The alluring Villefranche-du-Périgord has amongst others a baker and various fine little shops. Admire the age old houses and saunter through the beautiful streets. At the recreational lake of Frayssinet (7 km) you can fish, swim and rent pedal-boats. The ideal location for rest and recreation. The Dordogne is really inviting for a longer daytrip. Follow the beautiful route along the river. This will take you to the bastide village of Domme (36km) that has an extensive underground gallery with stalactites and bison bones from prehistoric times. A little further lies the picturesque La Roque-Gageac (38 km). You can also take a splendid canoe trip along this route.